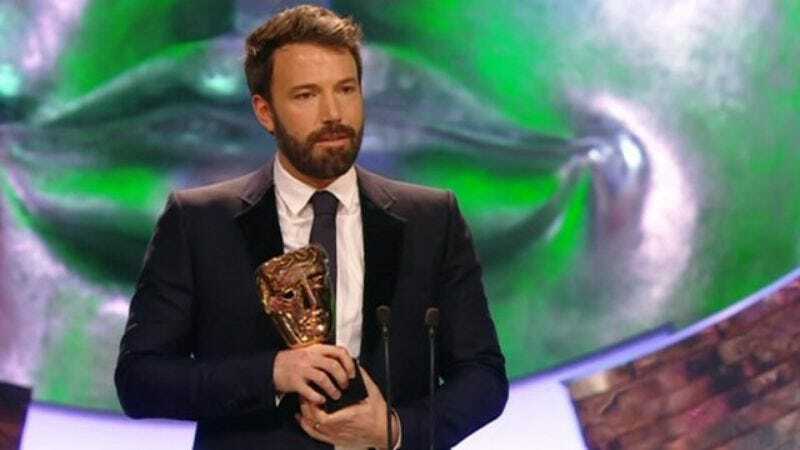 Though the Oscars’ snubbing of Ben Affleck has already been thoroughly scolded by his wins at the Golden Globes and the Directors Guild, this weekend’s big win at the BAFTAs was the most humiliating yet, delivered as it was in a cutting British accent. Argo took three top honors at the annual British Academy Film Awards, including Best Picture, Best Director, and Best Editing for its imaginative technique of splicing in a much more exciting ending, continuing the film’s seemingly irrepressible run to getting screwed over at the Oscars by old white men who preferred Lincoln. Meanwhile, Steven Spielberg’s hilarious comedy of errors about why America never should have left the British Empire earned another Best Actor victory for Daniel Day-Lewis, and fellow lock Anne Hathaway picked up another Best Supporting Actress win for Les Misérables and breathlessly thanked every individual member of Parliament, probably. Far less predictable were the wins for Amour’s Emmanuelle Riva—who finally shut down the idea that Jennifer Lawrence and Jessica Chastain are the only two actresses in the race—and another Best Supporting Actor nod for Django Unchained’s Christoph Waltz. And, on the purely British side of things it was all Skyfall, which easily picked up Best Original Song and Outstanding British Film honors—a first for the James Bond series that, after becoming the biggest movie ever in the UK, is kind of like being given a wristwatch that shoots poison darts, then also being told it has Indiglo: nice, but superfluous.